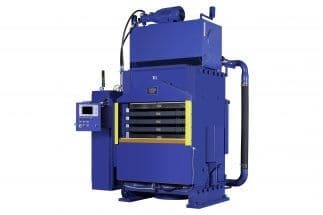 TMP, A Division of French, designs, manufactures, rebuilds, and services hydraulic presses, lamination presses, rubber mixers and related components, advanced controls and auxiliary equipment. TMP’s commitment to quality, our proven technology and dedicated service teams allow customers to produce higher quality products with increased production rates and reduced operating costs. In 2011 TMP announced our new operating name, TMP, A Division of French (formerly Technical Machine Products), a result of our new sales structure with The French Oil Mill Machinery Company, aimed at our continued effort to harmonize the TMP and French brands since TMP’s 2009 acquisition by French. With this change, TMP concentrates sales efforts on tilt-style intensive rubber mixers, lamination presses for the printed circuit board and plastic card industries and hydraulic presses for the composite and laboratory markets. Both TMP & French sell to the rubber markets with TMP serving new and existing customers while French focuses on their existing customers. 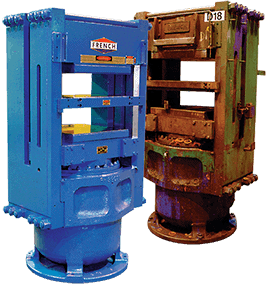 Learn more about TMP, A Division of French and our hydraulic presses, rubber mixers and other related equipment.